Nicci Beauvoir fell in love with the artist, David Alexander, in To My Senses, and then uncovered his killer in Recovery. 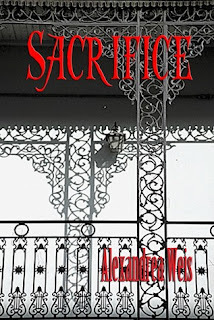 Nicci is back to finally confront David's dark past in Sacrifice. Stunned after seeing a man she believes to be her beloved David Alexander in a crowd outside of the St. Louis Cathedral, Nicci goes on a desperate hunt for the truth about David's demise. But to get the information she desires, Nicci must team up with David's former boss, the ruthless Simon La Roy. Nicci decides not to tell her fiancé, Dallas August, about her involvement with Simon. As Nicci becomes hopelessly entangled in Simon's sinister plans, Dallas discovers her secret, and tries to protect her. But one night on a deserted French Quarter street, Nicci unexpectedly learns what really happened to David Alexander. Now she must engage in a deadly game of intrigue to keep what she has unearthed from Simon La Roy. In a final confrontation, a revengeful Simon forces Nicci to choose between her life and revealing all that she has discovered. But what mystery is Nicci protecting and is it worth her future happiness? For Nicci there can be no happy ending unless she keeps what she knows about David Alexander hidden from the world. It's a decision that will cost her everything. Is Nicci willing to pay the price? In the end, there can never be a happily ever after without a little...sacrifice. This book is perfect for those who have read the series or are looking for a romantic mystery. Nicci is a dynamic character, she can be caring, inquisitive, and secretive. That last characteristic might get her into trouble, however. When she unearths her past lover, David's killer, she thinks she might finally get some rest and peace. She is not that lucky. Though she has found another love interest in Dallas, David may still come back to haunt her. When she believes she sees David in a crowd, Nicci decides to stop at nothing to uncover the actual secret behind his demise. To do so, however, requires that she join forces with Simon, David's past boss, who is secretive and powerful himself. Nicci hides all of her secrets from Dallas, which may not be the best start to their relationship. Can Nicci discover David's secrets while still keeping Dallas? This book was fast-paced and fun to read. It helps to have read the first two, though the author does a good job of filling the reader in. The romance between Nicci and Dallas is sweet and believable. The action rendered the story intriguing and hard to put down. This book is recommended to adult readers.